In North Carolina, an average of five people per day have a fatal overdose from an opioid, either heroin or a prescription drug. But anesthesiologist James Taylor thinks many – if not most – of those deaths could have been avoided if there were better management of pain and the drugs that people get to treat their pain. Taylor, who practices in Southern Pines, got involved more extensively in treating pain about six years ago. Southern Pines anesthesiologist James Taylor has been treating pain with complementary techniques for six years. He believes that using cannabinoids will become a more accepted part of pain treatment. “We started having pill mills, folks coming up from Florida into our communities and my primary care colleagues had been asking me to please take over the medical management of pain,” Taylor said recently. So, Taylor got a number of practitioners together in one room. Taylor said his decision resulted in a completely new practice, Integrated Pain Solutions, where he initially had all the different practitioners under one roof. For instance, he said that with a chiropractor nearby, “he’d say, ‘Check that hot joint, let me adjust it,’” during the same visit where Taylor might be doing an injection in the joint. “Then the patient miraculously did better and didn’t need another joint injection,” he said. Lately, however, Taylor is doubling down on a new way to manage pain: Cannabis. Section 7606 of the Agricultural Act of 2014 does not treat hemp as a controlled substance when grown under a compliant state pilot program. North Carolina has created such a program. In late 2015, the General Assembly passed the Industrial Hemp Act, which allows for the cultivation of hemp that contains less than 0.3 percent THC. And the law created an Industrial Hemp Commission that’s overseen the regulation of hemp. Farmers were permitted to grow hemp in the state for the first time this year, and the harvest is just coming in. According to Jeff Cartonia, head of the North Carolina Industrial Hemp Association, about 100 farmers received licenses to cultivate hemp. There were about 1,900 acres licensed and about 175,000 square feet of greenhouse space given over to growing. Taylor acknowledges that hemp exists in an ambiguous space legally. If the U.S. Drug Enforcement Agency decided to crack down on all forms of cannabis, this market would be in jeopardy. Part of North Carolina’s law requires extensive testing of any hemp products for human consumption to be sure they stay under that 0.3 percent THC limit. Medical uses of marijuana or THC are illegal in North Carolina, but that doesn’t mean patients aren’t availing themselves. About two decades ago, researchers discovered that humans have neurological receptors in their brains, in the immune and digestive systems and other places that are specific to chemicals, known as cannabinoids, that are found in cannabis plants. Since then, scientists have been exploring the role these cannabinoids might play in treating diseases such as multiple sclerosis, Parkinson’s Disease and epilepsy. Researchers have also examined the role of cannabinoids in treating pain. One of the most cited studies, done in 2015, found that there was some evidence to support the use of cannabinoids to treat moderate pain. And data published in the policy journal Health Affairs found that in states where marijuana use was legalized there were downticks in spending on pain medications for both Medicare and state Medicaid programs. But every review and study notes a dearth of reliable information about the effects of cannabis, both with and without THC. Because of federal marijuana laws, it is exceedingly difficult to study the effects of cannabinoids, said Alisha Benner, a palliative care physician. Federal rules restrict funding for cannabis research and restrict the cannabis that is studied to plants grown at a research farm located at the University of Mississippi. So, only a handful of researchers can really study cannabinoids. Benner said there hasn’t been a lot of U.S.-based research done, and what has been done hasn’t been conclusive. Nonetheless, patients are using it, Benner told a recent workshop for palliative care doctors and nurses sponsored by UNC’s Lineberger Cancer Center. She said those patients just might not be telling their physicians about it. And the market is responding to demand; growers are producing cannabis hybrids with differing amounts of all the cannabinoids. Some, in states that have legalized all forms of cannabis, are growing some with large amounts of psychoactive THC. Taylor said he believes that about one percent THC is the “sweet spot” for cannabis, but he’s nonetheless plowing ahead with recommending low-THC cannabinoid-infused oils and consumables for their patients. Joe Ameri, who manages the Hemp Farmacy, says his company is growing so fast he’s having trouble keeping track of all his employees. The company opened a new dispensary in Jacksonville in early November. 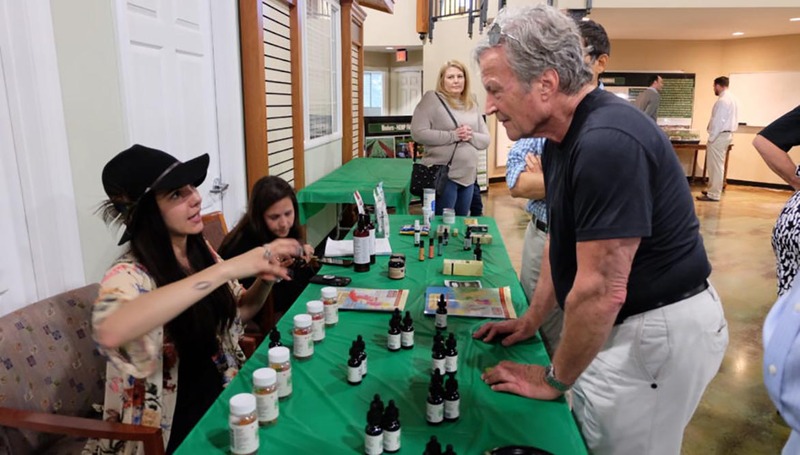 Taylor has partnered with the Hemp Farmacy, a Wilmington-based business that sells hemp seeds, consults with farmers interested in growing hemp, and also sells cannabis oils infused with carefully titrated amounts of the many cannabinoids found in hemp. The national Hemp Industries Association holds that cannabinoid products should be legally defined as supplements, not drugs or pharmaceuticals subject to DEA control. And that’s how the Hemp Farmacy is marketing its products. Ironically, while marijuana is still illegal to federal officials and heavily regulated in the states that have legalized it, the FDA has not issued a ruling as to whether cannabinoid oils and products are supplements. So, the products are essentially unregulated, because supplements have not been regulated by the FDA since 1994. “FDA… may consult with its federal and state partners in making decisions about whether to initiate a federal enforcement action,” the agency wrote on an information page about cannabinoids. But for now, the agency is allowing this gray space in regulations to remain. That irony isn’t lost on Taylor. To ensure the quality of Hemp Farmacy products, he invested in a liquid chromatography/ mass spectrometer which can be used to test both the cannabis oils and the urine of people using them to be sure that there’s little or no THC present. Mass spectrometry machines can start in the hundreds of thousands of dollars. But there’s a logic: The machine allows the Hemp Farmacy to display the chemical profile of its product to guarantee its legality and quality. And it allows Taylor to monitor what’s in his pain patients’ urine with more specificity than a typical in-the-office dipstick test. He stood in front of several dozen doctors, nurse practitioners and others, telling them about how cannabinoids might help their pain patients, and others. He discussed a concept called the “entourage effect” which describes the way that the many compounds in cannabis might work together more effectively than just a single cannabinoid. Sandra Ferguson is a nurse who works at Moore Place, the Urban Ministries housing facility in Charlotte that houses about 120 people who were formerly homeless, many because of their drug use. “If we could get the price point down to something that’s affordable you could get people who would decrease the crack, decrease the opiates,” she said. Ferguson used cannabidiol oil from the Hemp Farmacy to help reduce inflammation in her leg after a stress fracture. She’s convinced that it worked for her, despite the dearth of literature to support her belief. Taylor acknowledged the need for more research. He also noted that there’s a real need for standardization. “When you order [cannabinoid] or hemp products online, you don’t know what you’re getting,” he said, recommending the Hemp Farmacy products. He also suggested to the doctors there that they send their patients’ urine samples to his in-house lab, so they can monitor that the patients are only using cannabidiols, and not cannabis that also includes THC. This creates another revenue stream to pay for Taylor’s mass spectrometer. Ferguson said she trusts what she obtained at the Hemp Farmacy the back of a pamphlet reads: This Hemp product has evaluated by the FDA, but has been manufactured with hemp in accordance with the FDA's requirements. Taylor believes hemp can be instrumental in helping people in pain, and he believes that eventually, the medical community will fall in line with thinking on hemp.